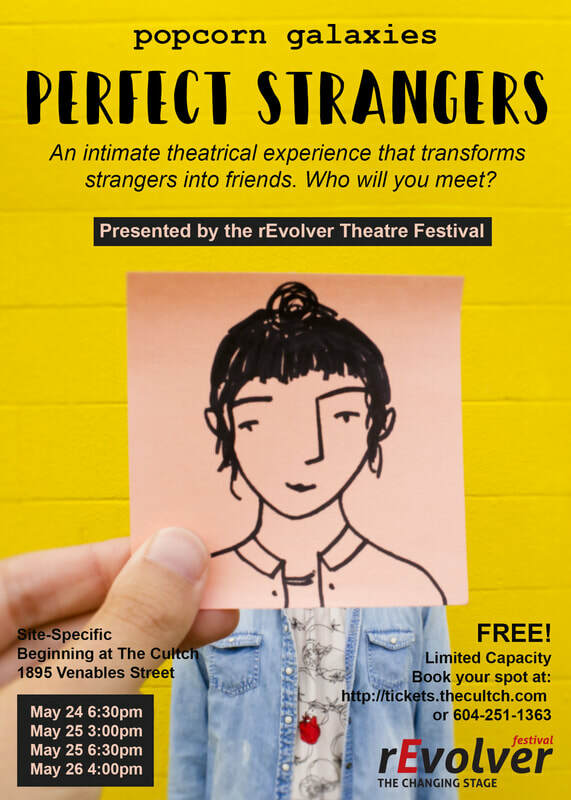 Perfect Strangers is a new site-responsive, micro-performance which explores themes of intimacy, human connection, and friendship. Audience members who have never met are paired up and embark on a walking journey through the neighbourhood surrounding the Cultch. The pairs are guided through a series of questions and conversation topics which become increasingly intimate. Throughout the journey, the pairs record moments of their experience on Post-It notes which are posted as they walk around the neighbourhood, forming a miniature guerilla art-installation for other passers-by and animating the landscape with a fleeting archive of transforming relationships. This quirky theatrical ice-breaker attempts to answer the question: how can a group of audience members start off as strangers and become friends? How do real life relationships form in the age where so much of our human connection is mediated by technology? This performance is your chance to have a face to face encounter with a perfect stranger who you may otherwise never meet. Come alone and leave with a friend! Perfect Strangers will proceed rain or shine. Please dress for the weather and wear comfortable walking shoes. This show includes approximately 90 minutes of walking over occasionally uneven ground and a 30 minute reception afterwards. We acknowledge the support of the Canada Council for the Arts and Boca Del Lupo Space Residency.